Satisfy your taste buds with Knorr Stock Cube Vegetable 8 x 10g, Knorr has carefully selected quality ingredients that enhance your cooking. 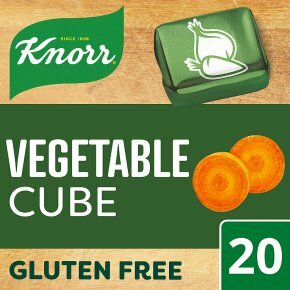 Knorr Vegetable Stock Cubes aim to enhance the natural favour of your dishes, they are bound to bring an irresistible depth of taste to your meals. Gluten Free. Free from artificial colours and preservatives. Each stock cube will enrich dishes ranging from risottos to pies, soups and more, effortlessly adding a full and rich taste. Quick and easy to prepare ? Just add your stock cube to 450ml of boiling water and stir into your dish to enjoy that great fish flavour.Treat your taste buds and add an extra boost of taste to your dishes with Knorr Vegetable Stock Cube. The authentic flavours of Knorr Stock Cube Vegetable 20 x 10g are perfect with dishes ranging from risottos to pies, soups and more. Your family and friends are sure to love the flavour of our Vegetable Stock Cubes. On top of the mouth-watering taste, our Vegetable Stock Cubes are quick and easy to prepare. Simply add your stock cube to 450ml of boiling water and stir into your dish to enjoy that great fish flavour or crumble straight onto your dish, you choose whichever way you fancy! Either way, Knorr stock will be ready in minutes! Use Knorr Stock Cube to create a delicious, rich accompaniment to your main dish. You can find a great selection of recipes from Knorr and discover our other quality stock cube variants such as Chicken and Ham at www.knorr.com/uk, don?t hesitate to take a look! Looking for some inspiration? why not try our Cream of Mushroom Soup? A hearty classic, this mushroom soup is food for the soul. Serve with some crusty bread and you'll have yourself an unbeatable dish! To discover this recipe go to www.knorr.com/uk/recipe-ideas/cream-of-mushroom-soup.html At Knorr we believe if you cook with a great stock, made with carefully selected ingredients, slowly simmered, with a rich flavour it will taste so good, you may need a bigger table to satisfy all of your friends and family! We also believe that good food matters and everyday meals can be just as magical as special occasions. We source high-quality ingredients to create delicious stocks, gravies, soups and seasonings enjoyed by families across the world. How to use Knorr Stock Cubes: -	Dissolve the cube into 450ml of boiling water. -	Add the cube directly into the dish. -	Mix the cube with a little olive oil and use to coat vegetables before roasting.